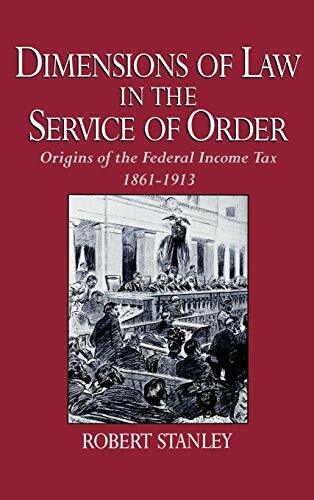 A sophisticated and accessible application of the newest theoretical work in public-policy history and legal studies, this book is a detailed account of how a permanent income tax was enacted into law in the United States. The tax originated as an apology for the aggressive manipulation of other forms of taxation, especially the tariff, during the Civil War. Levied with very low rates on a small proportion of the population and raising little revenue, the early tax was designed to preserve imbalances in the structure of wealth and opportunity, rather than to ameliorate or abolish them, by strengthening the status quo against fundamental attacks by the political left and right. This book shows that the early course of income taxation was more clearly the product of centrist ideological agreement, despite occasional divergences, than of "conservative-liberal" allocative conflict. If you have any questions about this product by Robert Stanley, contact us by completing and submitting the form below. If you are looking for a specif part number, please include it with your message.